Semi-Hermatic compressor for R22/R134a/R404a/R507 refrigerants, fitted with crankcase heater, suction and discharge valve and already compressor oil change. Gauge panel and automatic reest HLow pressure switch, oil pressure switch. Suction Accumulator and Oil separator. High efficiency condensers (1 fan, 2 fans or 4 fans). Liquid receiver complete with pressure relief valve maximum operating pressure 350 psi. Liquid line sight glass and filter drier. - Hot dip galvanized steel base frame. Above capacity based on R-404a, Air Entering +32℃. 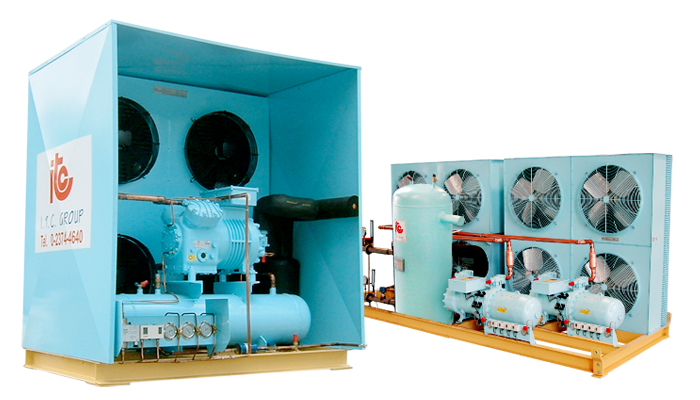 ITC has greatly developed Air Cooled Condensing unit (SAB) into the state-of-the-art technology which is far from what you have expected. It is a very reliable machine capable of providing cool internal environment by the process of heat rejection; moreover, it serves as a condensing medium in refrigeration system. All heat loads for instance light, products and human’s heat loss will be expelled by this unit for keeping the working area cool. It also prevents the machines and product from building heat up. In the long run, this condensing unit can avoid the machine from overheat, preserve the products and always maintain the system at low temperature.